Having finally got around to digging up our parsnips, we needed to start using them fast – you can see by the photograph below how huge they were, but also somewhat manky. It seemed to me that parsnips would pair well with nuts as they have their own rather nutty quality, so I wanted to use one of the nut oils that I’d recently been given. I’d fancied making a parsnip cake for years and finally I got around to it. I had a trawl through my various cook books and surprisingly enough, I found quite a few recipes. I didn’t, however, find anything that seemed right to go with chocolate, so I got my thinking cap on and came up with my own parsnip cake recipe. Spent ages cleaning parsnips and chopping out the bad bits! Grated 200g of clean parsnips. Beat 150g cardamom sugar (caster) with 3 eggs until thick and pale. Added a pinch of salt and 125ml walnut oil and beat some more. Sifted in 200g flour (half wholemeal spelt, half white), 1 tsp baking powder and 1/2 tsp bicarb of soda. Folded this in together with the parsnips. Gently stirred in the chocolate bits. Scraped into a 23cm round cake mould (in retrospect should have used my 22cm one, which would have given a deeper cake). Baked at 180C for 36 minutes. Spooned 60g cardamom (caster) sugar into a jug. Added 3 tbsp orange liqueur. Stirred and poured over the hot cake. Left in the mould to cool completely. The cake rose well and had a very light but moist texture. I was surprised to find I couldn’t detect the parsnip at all, either by taste or by eye. I can see why this was a good way of bulking out expensive cake ingredients in the past. The cake had a lovely nutty flavour to it, but not distinctively and definitively of walnut; the parsnips no doubt played their part. The chocolate worked well as did the orange sugar topping which was delicious, though had a certain heady alcoholic quality to it. All in all, this was not bad for a first attempt. If truth be told, I prefer my cakes to be a bit more substantial and I’m not a huge fan of using only oil in a cake. Next time, I think I’d use half butter and half oil. That way, I’d hope to get a better texture but keep the lovely nutty flavour. However, if dairy is an issue, these nut oils make for a good substitute and of course the milk chocolate can be changed to dark or, dare I suggest it, left out all together! I am submitting this to Ren’s lovely Simple and in Season event found at Fabulicious Food. 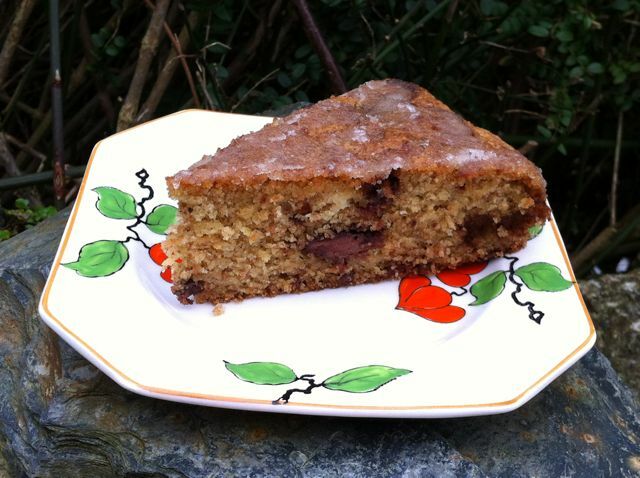 Update 5 March 2012 – Charlotte of Go Free Foods adapted this quite significantly and came up with a pumpkin orange & cardamom cake which looks gorgeous. Thanks Johanna. having tried this one, I really want to do try more parsnip cakes. As for the garden, all it’s got in it at the moment are a lot of weeds! hey ho, spring is fast approaching. Truly, great minds think alike, parsnip cake season is here! And they are the best cakes ever! I am often asked for the good old parsnip cake by family for get-togethers. Love the idea of cardamom in there, one of my favourite spices. Great recipe. How, I’m wondering, has it taken me so long to recognise the poor parsnip as an excellent cake ingredient? Cardamom is one of my favourites too, after cinnamon. Must be the C that does it cos I love chilli too! I’ve never used parsnips in cakes but will have to give it a go. the cake looks great. He he, it’s not the most obvious cake ingredient is it? What a fantastic recipe, I love it. You are so creative! I adore parsnips in cake (and most root vegetables for that matter) and love the different flavours you have going on here; cardamom, chocolate and orange. Yum! Sounds like a wonderful recipe creation! At uni we are doing a new product development module. One group is making a low fat, low sugar and high fibre cake, and they are using parsnip as their fat substitute. They’ve used cocoa, lemon and crystallised ginger in their recipe too and I think I’m their biggest fan! I’m pretty sure I’d love this just as much 🙂 I say bring on the parsnip cakes! Now that combination of flavours sounds really interesting. It’s interesting to how so many fruit and veg can be used as a fat substitute – the black beans worked really well as did squash. That’s a very nice way of putting it Hannah, but it did make for an excellent cake! Wow, what a parsnip! I bet that did take ages to sort out. Still, well worth is as the cake looks yummy! Thanks Ren. Now if it had just been the one parsnip, it wouldn’t have been so bad, but I had several like this and it wasn’t my favourite job! Great idea for a cake, would never have thought to use parsnip but they are naturally sweet and moist. Yes and they have a certain nutty quality too – they work surprisingly well. Don’t be so mean!!! It’s just had a a bit of a hard time. Dom try parsnip, works brilliantly well. Very impressed with your vegetable growing skills…a baker and a gardener! This cake looks really interesting and love the idea of using parsnips…isn’t it funny how grated parsnip looks just like grated cheese?! Not sure you should be too impressed with my gardening skills – don’t think my parsnips would have been allowed in a show, never mind winning any prizes! Didn’t pcik up on the resemblance between cheese and parsnip, but observation has never been my strong point! Sounds like a gorgeous combo of flavours and it looks delicious too. Don’t envy you the parsnip peeling though. You’ve given me an idea for cardamom sugar also, thanks! Ha ha Sheelagh, never peel parsnips, just cut out any bad bits. Did have to cut out an awful lot of this one though – very fiddly. Carrot cake – bah! Who needs carrots when they can have parsnip!!! Did you grow any parsnips last year Laura? These were a first for me and despite the many problems, it was very satisfying using our own. Do let me know if you give it a go. Really nice idea. I’ve not used parsnips in a cake before because I thought they may overwhelm the taste of anything else, but I can see I was wrong. I like the sound of that orange topping and the nutty edge from the oil. Yes Phil, I did wander about this too, but it really doesn’t, although the oil was quite strong. I’ve never tried baking with parsnips, I imagine they work really well with walnuts in flavour. That is quite a creepy looking parsnip though! I’m glad you managed to turn it into a pretty cake. I suppose that makes you some sort of a Fairy God Mother of vegetables..? Jo, thank you, but I’m not sure my veg think I’m much of a fairy godmother – I produce scary parsnips and beetroots that all got eaten by voles. Now the voles might think I’m a fairy godmother!